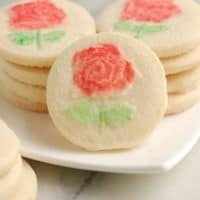 These Rose Shortbread Cookies are so pretty and are perfect for teatime, a bridal shower, a birthday party or Mother’s Day. 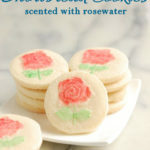 The cookies are flavored with a hint or rosewater for a flavor that is as delicate as the design. This is yet another recipe that shows the versatility of buttery shortbread dough. It’s perfect as a simple cookie and as a base for a myriad of other cookies recipes. 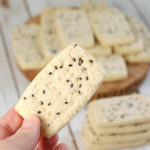 My shortbread squares are endlessly adaptable since they can be made with a variety of toppings. One of my all-time favorite cookies is this lemon curd filled shortbread. 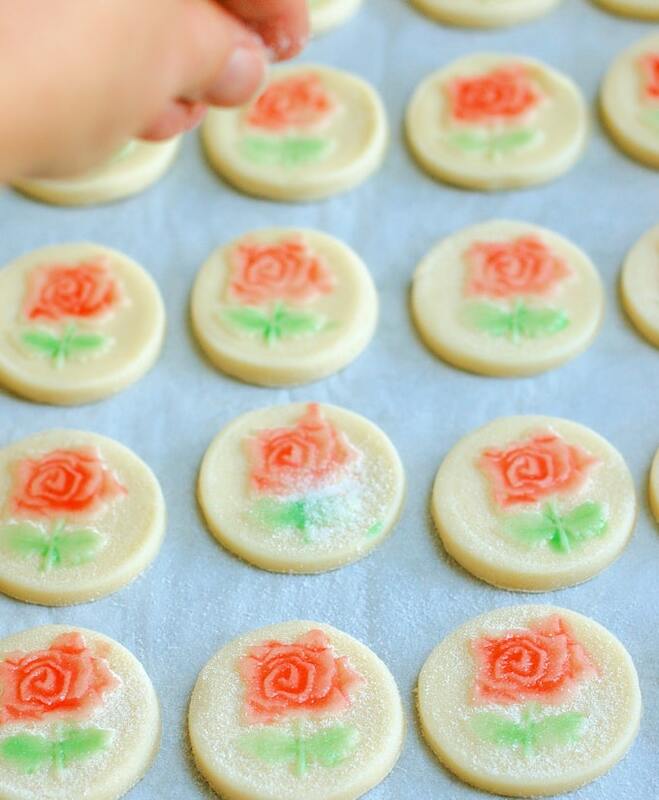 These Rose Shortbread Cookies are so pretty and are perfect for teatime or Mother’s Day. When I baked for a British tea shop I always had these on the menu. I honestly can’t remember how I came up with the method for painting the roses with tinted egg whites. I started making these cookies way back before there was an internet. Yes kids, it’s true, there was a time when we had to find recipes in a book or magazine! 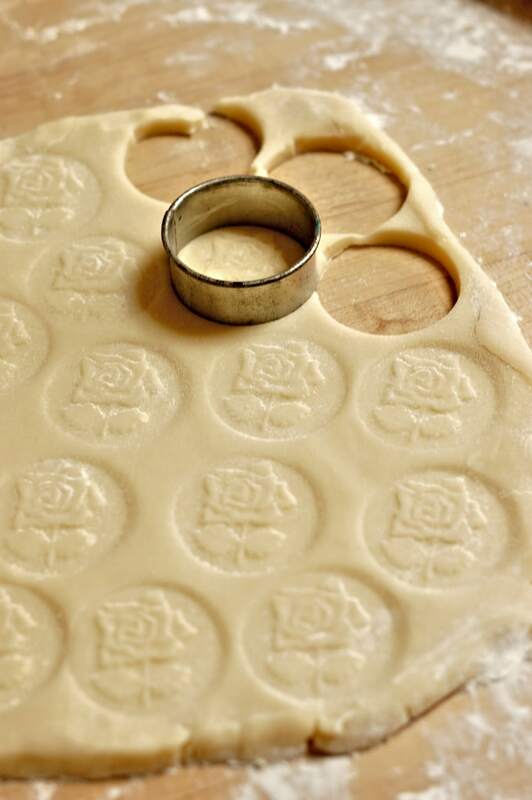 The rose on top is made using a cookie stamp. There are lots of designs available. I use a stamp with a Christmas tree to make holiday shortbread cookies. The main key to making the “paint” is to let the egg white age at least a day before painting the cookies. As egg whites age they liquify, making it easier to paint on the cookies without globbing up (that’s a technical pastry term). Scoop the foam from the surface with a spoon and you’ll have a nice clear paint that’s easy to brush onto the cookies. 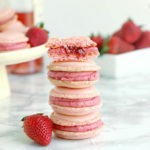 I flavor these cookies with a hint of rosewater to complete the theme. 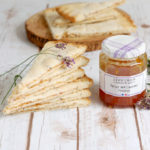 The strength of rose water can vary pretty widely so I suggest putting in the lesser amount listed in the recipe, then taste the dough to see if you want more. I love the flavor of rosewater, but a little goes along way. Put the prepared cookies in the refrigerator to chill before baking. Putting cold cookies in the oven slows the spreading and puffing of the cookies as they bake. This helps keep the rose design intact. Roll the dough then stamp the design all over. Sprinkle the cookies with sugar to set the design and add a sparkly finish. 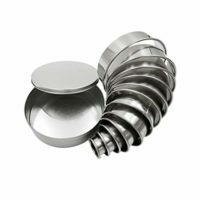 This next section is for all us baking geeks! If you prefer to just follow the recipe and aren’t interested in the hows and whys, just skip to the recipe and go for it. If you’re into the hows and whys of recipe development, keep reading. Keeping the rose pattern intact and attractive was my main challenge for this cookie. 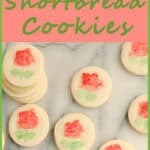 If the cookies puff up and crackle in the oven then you can’t tell it’s a rose on top, and the whole effect is lost. First off, I use cake flour rather than all purpose flour. Cake flour is slightly acidic. Acidic foods don’t brown very well. 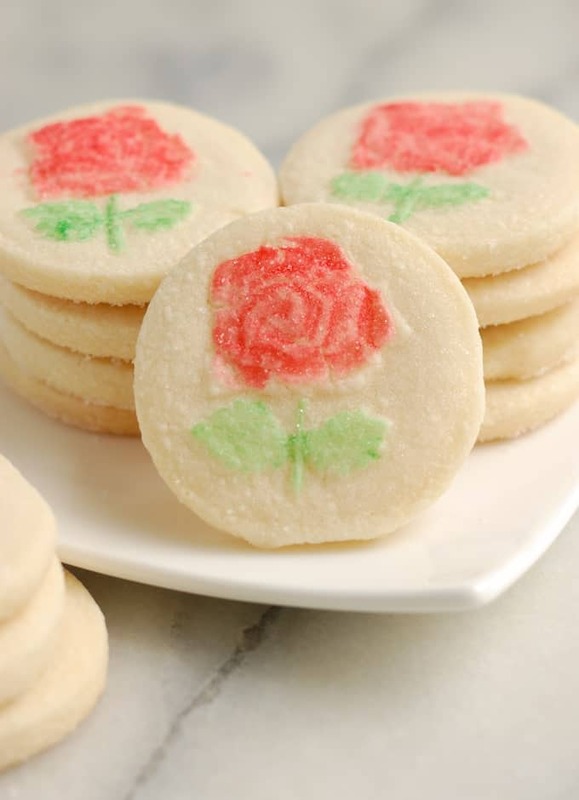 I like a paler cookie to really show off the colors of the rose. During baking a more acidic dough will set faster than a more alkaline dough. Which is good, because the rose pattern will set before it has time to become distorted. I also switched the sugar in the dough from granulated to powdered sugar. During the creaming process, granulated sugar crystals cut through and aerate the butter. The air pockets expand in the oven giving rise to the cake or cookie. But a big rise in the oven would distort the rose pattern. Cookies made with powdered sugar will spread a little more than cookies made with granulated sugar. The finely ground sugar absorbs more moisture which softens the dough. 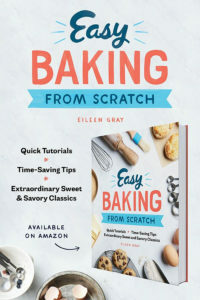 But remember that the acidity of the cake flour does help the dough set faster in the oven, which corrects for any extra spreading caused by using powdered sugar. 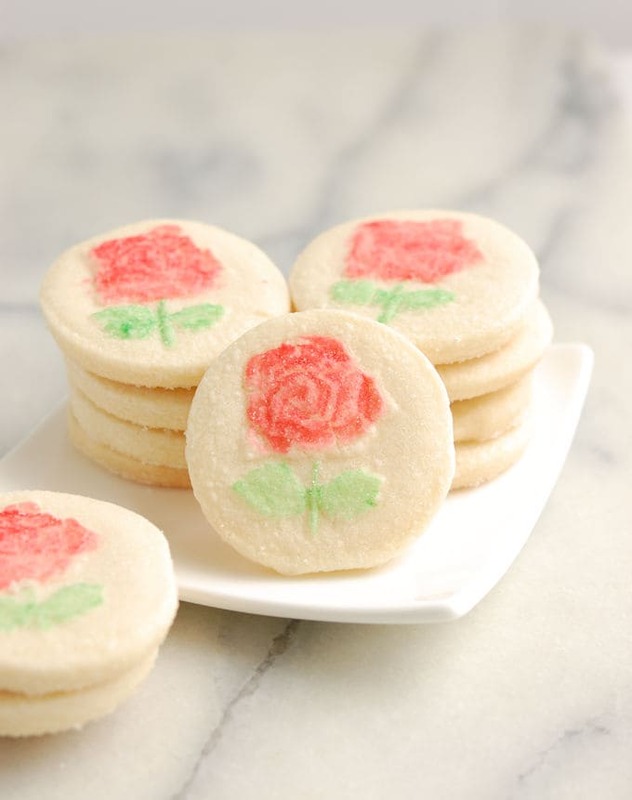 These Rose Shortbread Cookies are so pretty and so tasty. 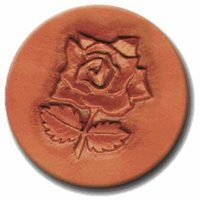 The rose on top is made using a cookie stamp painted with tinted egg whites. Lightly whisk the egg white to loosen it up then divide it between two small bowls. 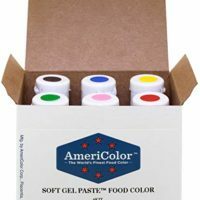 Tint the whites in one bowl with red food coloring and in the other bowl with green food coloring. Cover the bowls and refrigerate them overnight. The whites will liquify a bit over night and the color will become more even. This makes it easier to paint the cookies. This step can be done several days in advance. Combine the butter, sugar, salt and rosewater (start with the smaller amount and adjust to taste) in a mixer bowl and mix until softened and combined, do not aerate. Add the flour and mix just until a dough is formed. Taste the dough and add more rosewater if desired. 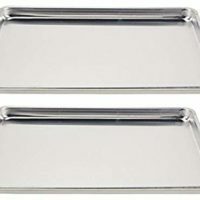 Line a 1/2 sheet pan with parchment paper. On a lightly floured work surface roll the dough to 1/4" thick. 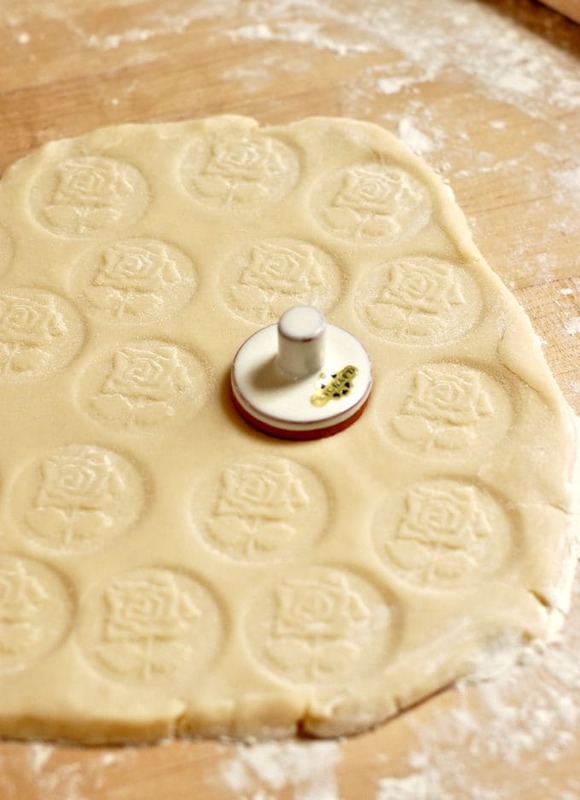 Use the cookie stamp to imprint the dough all over, keeping the imprints as close together as possible. Use a round cutter to cut out the stamped rounds. Line the cookies on the prepared sheet pan about 1/2" apart. These cookies don't spread much so you can put them fairly close together. Continue re-rolling, stamping and cutting until all the dough is used up. 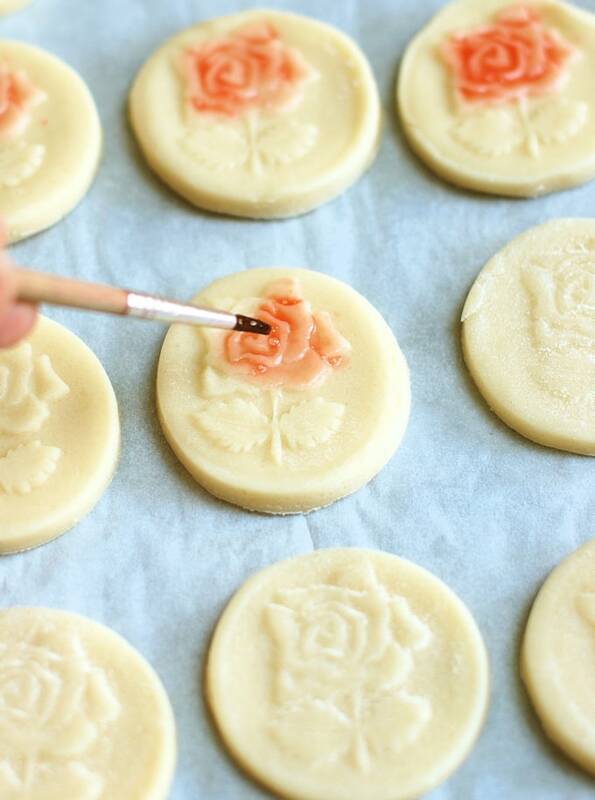 Use a small paint brush to paint the red-tinted egg whites onto the rose part of the pattern. Use the green to paint the leaves. Sprinkle the painted cookies with granulated sugar. Put the cookies into the refrigerator for at least 20 minutes (see note). Meanwhile, preheat the Oven to 350°F. Bake the cookies until the center is set and the edges are just beginning to brown, about 20 minutes. If you're oven bakes unevenly, rotate the tray halfway through baking. 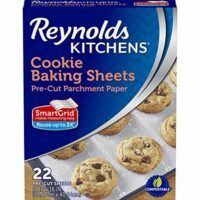 To work ahead, you can assemble and paint the cookies, wrap the tray and refrigerate for a few days before baking, or freeze up to three months. Defrost and then bake. Great post and such beautiful cookies! Perfect post for Mother’s Day. Just beautiful! Your work is lovely and I look forward to seeing future Sunday Supper posts. One of my favourites. Well thanks, Kimberlie. I’m a fan of your blog too. These cookies are absolutely gorgeous! I love the how they turned out and can’t wait to try the technique! Thanks, Carlee. I hope you give it a try. There are so many of those cookie stamps for all occasions. I have one with a Christmas tree that I use for the holidays. These cookies are beautiful. 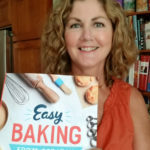 Thanks for sharing all your recipe development notes too – there’s some great info there. Such pretty roses on these! These are simply beautiful! They seem like a lot of fun to make. The painting process would be very relaxing. Thanks, Laura. They are fun to make and the cookie stamps come in so many different patterns. Aww, thanks so much, Michelle. 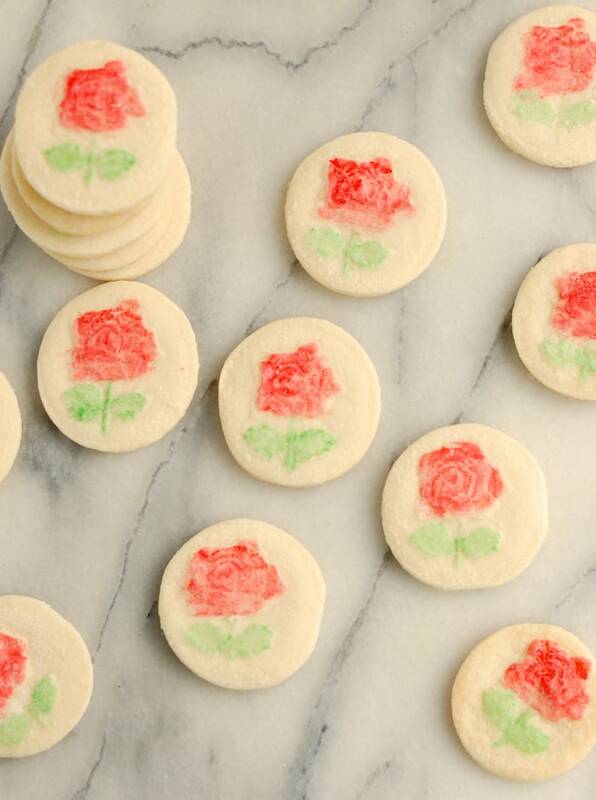 I love your cookie stamp and the pretty rose design on each cookie. These look amazing! You get my vote for most beautiful dish this Sunday. Aww, these are so adorable! And you are very talented!